00:35:00 Makes 4 servings, 1/4 recipe (205 g) each. Makes 4 servings, 1/4 recipe (205 g) each. 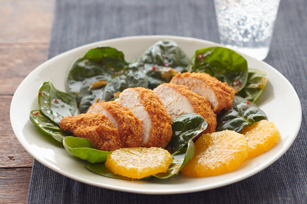 Oranges add a refreshing twist to these baked chicken breasts. Spread chicken with 2 Tbsp. marmalade. Empty coating mix into shallow dish. Add chicken; turn to coat both sides of each breast. Place in 13x9-inch baking dish. Bake 25 min. or until chicken is done (170ºF). Mix dressing and remaining marmalade. Add to spinach; toss to coat. Place on 4 serving plates. Top each with 1 sliced chicken breast. Garnish with oranges. Substitute apricot preserves for the orange marmalade. Serving Size Makes 4 servings, 1/4 recipe (205 g) each.